IN SAFE HANDS: Lojung Kippa Sherpa’s children testify to police after the CIB rescued them from Happy Home Nepal in Dhapakhel in February. Lojung Kippa Sherpa is from the mountains of eastern Nepal, and had difficulty feeding and raising her three children. So, when her sister told her about an organisation promising to take them to Kathmandu and provide free schooling, she readily agreed. That was six years ago. 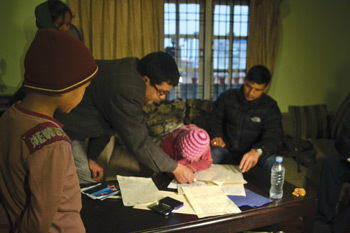 In February, police raided the Happy Home Nepal shelter in Dhapakhel and freed four young boys and girls, among them Sherpa’s three children who were found to be undernourished. One of them was suffering from TB and hadn’t been to school for two months. Happy Home’s founder, Bishwa Pratap Acharya, allegedly used the children as bait to raise funds from Czech, Slovak and British donors, amassing tens of thousands of euros since 2006 while neglecting the children. “The owners didn’t let me see or take my children back home for all these years because they used them to make money,” Sherpa said after being reunited with her children recently. Happy Home was raided in February the Central Child Welfare Board and the Central Investigation Bureau (CIB) after repeated complaints of abuse. Acharya is charged with fraud, abduction and child-trafficking and is the first person ever to be detained for child trafficking in Nepal after the Lalitpur District Court refused him bail. 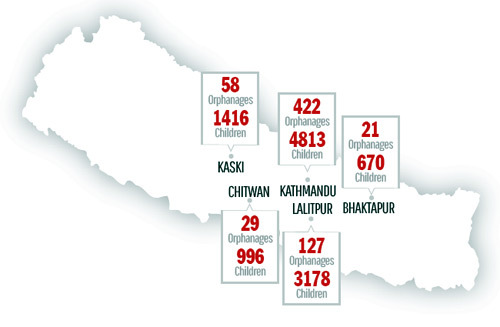 There are 15,000 children in over 787 registered orphanages across Nepal, but child rights activists say the number could be much higher because many children and shelters are not registered. Surveys have shown that although many shelters call themselves ‘orphanages’ 80 per cent of the children have parents. “Most children from remote districts such as Humla and Kalikot have parents, and the owners make money from them by promising the parents free education,” says Tarak Dhital of the Central Children Welfare Board (CCWB). The number of fake orphanages has increased after the crackdown on the adoption racket, and traffickers have set up such homes as a new revenue stream based on foreign donations. Despite receiving complaints against these shelters, the child protection authorities don’t immediately raid and “rescue” children citing lengthy procedure and limited resources. “We are doing our best with whatever resources we have to ensure strict monitoring in these homes but we aren’t always able to act on all the complaints we receive every week,” says Namuna Bhusal of CCWB. So it came as a surprise to many child rights activists when CCWB raided Amako Ghar in Kuleshwor for its sub-standard hygiene and care less than two weeks after the raid at Happy Home Nepal. Amako Ghar, which was set up by social worker Dil Shova Shrestha, and the raid on her shelter and the ‘rescue’ of its 35 children got wide media attention, eclipsing Happy Home and the larger structural problems with child protection in Nepal. What happened to the Shahi children is a saga of how innocent children suffer even when the authorities try to protect them in the blaze of media coverage. A front page investigative story in Nagarik daily in February accused Dil Shova Shrestha of running a sub-standard shelter and of sexual abuse. This unleashed an uproar in social media in Dil Shova’s support, and the story is being investigated by the Press Council. Although Amako Ghar had sub-standard hygiene and care, most agree the shelter and its founder were unjustly punished. 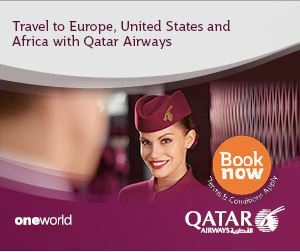 There has been a sudden spurt in ‘orphanages’ ever since inter-country adoption was tightened. 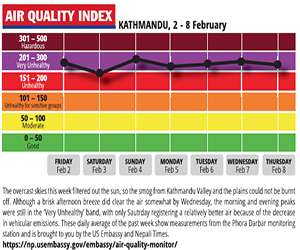 It is not a coincidence that 90 per cent of the shelters are in the five top tourist districts: Kathmandu, Lalitpur, Bhaktapur, Kaski and Chitwan where foreign visitors see the poor condition of children and donate generously. Networks of child recruiters convince parents to give up their children and bring them to shelters for a commission. “We have found local politicians are either directly involved or protect trafficking networks,” says a child rights activist. They also blame foreign volunteers and donors who easily buy into the plight of children. Most ‘volunteers’ have to pay to be a part of these shelters, and traffickers are known to tour Europe with photo albums of children. In September 2011, young girls from western Nepal, trafficked as fake orphans by the infamous human trafficker Dal Bahadur Phadera and his cohort to Michael Job Centre (MJC) in southern India, were rescued through the efforts of Esther Benjamins Memorial Foundation. EMBF then filed a case against Phadera and MJC for their involvement in human trafficking. But the case is still undecided because Phadera used his political connections to get hearings postponed. Sano Paila, a Birgunj-based group that works with Freedom Matters in UK, has tried to get permission from the National Human Rights Commission and CCWB to rescue and rehabilitate the remaining children from Happy Home. But Lalitpur Chief Distrcit Officer Sashishekar Shrestha has refused to sanction it saying there haven’t been reports of mistreatment at Happy Home, and there is no need for rescue now. A firsthand account of the insurgency from Sankhuwasabha district.